Permanently welcoming a child into a loving family changes EVERYTHING! The child will no longer face the uncertainty of life in foster care. The family grows, introducing the new child's already formed personality into the family's established mix. Very special people make this important decision. I am lucky enough to live about a block from such people....so....let me introduce my neighbors! In back from left to right: Zeb, Gini, Hoke; In front from left to right: Liberty and Daniel. It isn't important which of the kids will soon be adopted. It doesn't alter the fact that this is a family. Last year, they all actively participated in the decision to include another person in their tight unit. In fact, the decision involved extended family members too. In the "immediate" family, the eldest daughter, Jessica, is missing from this photo. She's a lovely grown woman (who is my Photoshop instructor and an artist in her own right!) This image depicts those living in the "family home"....a block away. 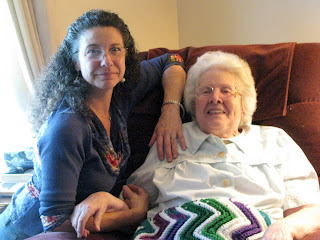 Another family member, Grandma, also posed for the Decision Portrait Series. She's my College Student. This decision was carefully made by everyone involved...a year ago. Now, this is simply a family....a fantastic family! Personally, I don't think I could have made it through the day my younger son Alex left home without Gini. She was there for all of us, too. The love that exudes from their home simply spills out all over the neighborhood. I think this decision, this portrait, and this family make a very important statement for the entire series. 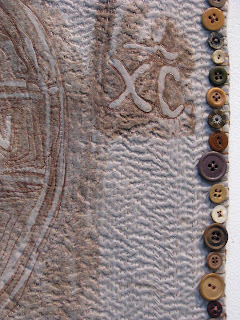 Now I'm busy correcting this on the other quilts.....including Never Accurate But Never Dull....which was just accepted by juror Glen Kaufman, for inclusion in "Fiber Artistry - Journey of the Imagination" at the Jacqueline Casey Hudgens Center for the Arts in Duluth, GA. Unfortunately, I won't be able to attend the opening but this exhibit is close enough to actually SEE in person at a later date! I'm so excited! (Above and below: Details of Death the Divider. Click on images to enlarge. Obviously, I remain under the kantha stitch spell. This piece is really "thick". I use recycled black felt from a kayak shop for the center. Most stitches were done a "poke at a time"....but, even so it was very mediative. 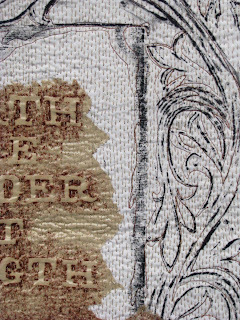 Also, this was the first grave rubbing quilt that I didn't free motion around the individual letters. The words came from Birmingham, UK (I think?) and the floral pattern came from Hollywood Cemetery in Richmond, VA. 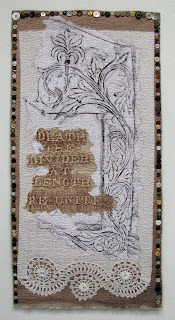 Meanwhile, I've found a "rhythm" for free motion stitching the collected epitaphs on sheer chiffon. Images coming later! The very worst thing that could ever happen to me would be the loss of one of my sons. Approaching this significant portrait meant meeting two wonderful people who daily live with this very worst experience. Of course we shared a very meaningful time, one I'll never forget. Their lives were forever changed; yet, they are strong....real role models. They brought photos that their son snapped while in Iraq. We talked about his friends; they've met many of them. We talked about their son. I took a digital photo of the official Marine picture...right through the frame...on my studio floor. Though touches of red, white, and blue were used to create the final portrait, I was careful not to overshadow his piercing eyes with color or anything else that could shift attention away from the image of a very young man, a proud solider who knowingly made a life altering decision. He decided to enter the Marines; he decided to serve his country; he knew the risks; it was his choice to make. His parents are proud of him, as they should be. Most of the Decision Portraits are meant to reflect a specific individual but also suggest others in the same situation. 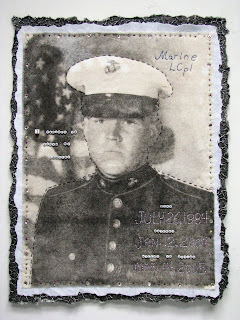 This portrait really is Marine Lance Cpl. Joshua L. Torrence. I want people to see him. He is loved and missed; his life is important. Yet, I hope people viewing this work also see through him all the others serving our country. They are important too...and each one made this decision....to serve our country. Marine Lance Cpl. Joshua L. Torrence. Died: March 14, 2005. Columbia, SC - A 20-year-old Marine from Lexington has been killed in Iraq, the Defense Department said Tuesday. Lance Cpl. Joshua L. Torrence was killed in Iraq on Monday while fighting in Anbar province, the Defense Department said. Torrence was a crewman on an amphibious assault vehicle, a lightweight tank than can go under water, said Lt. Barry Edwards, a spokesman for the 2nd Marine Division. Torrence was a leader who lived life with a purpose, his former high school football coach Mark Cagle said. "He is a wonderful young man who exemplifies all that's good about family, our country, God," said Cagle, who coaches at White Knoll High School. "I can't say enough good things about him.". Torrence graduated from White Knoll in 2003 and joined the Marines in January 2004. Torrence played on the first-ever White Knoll football team in 2000. He was a leader on and off the field, and always made sure to visit when he was home on leave, Cagle said. "We were looking forward to seeing him," he said. "He was supposed to have a leave in April." Cagle said Torrence was proud to serve in the Marines. "He felt there was a purpose for him being there," Cagle said. "I've got an 11-year-old son that thought Josh was unbelievable...If my son Steven grows up to be like Josh Torrence, I'd be unbelievably proud of him." LEXINGTON, SC - While a military jeep towed Lance Cpl. Joshua Torrence's casket into the cemetery, a half-dozen soldiers dressed in Civil War uniforms escorted him to his final resting place. Torrence, who loved being a Civil War re-enactor and dreamed of service in the miliary, was buried Thursday. A member of the 2nd Assault Amphibian Battolion, the 20-year-old Marine was killed March 14 in combat in western Iraq's Anbar province. The old mixed with the new throughout the ceremony. A platoon of re-enactors and U.S. Marines fired successive volleys in their young comrade's honor, while Torrence's father was dressed in a Civil War-era officer uniform to honor his son. The two had participated in re-enactments of the war for the past decade. The ceremony began with re-enactors from the 3rd South Carolina Volunteer Infantry slowly marching the coffin into the church. It ended with a marine presenting Torrence's mother with the U.S. flag that had been draped over her son's casket. "He went to serve and to sacrifice in the cause of freedom," the Rev. Bill Green said. "He knew the risks. He understood his decisions. He had the support of his family." Torrence had written to a friend to describe his joy at being a Marine, Green said. "For those who fight for it, freedom has a special flavor those protected will never know," he wrote. Torrence also made his mark on the football field as an offensive lineman and highlights of his games were shown at his funeral. Several White Knoll High School teammates wore their football jerseys even though most of them graduated with Torrence in 2003. Torrence is the second member of the military from Lexington to die in Iraq. Army Reserve Pfc. Thomas Caughman, also 20, died when his armored vehicle was ambushed June 9, 2004, near Baghdad. Thirty-one soldiers from South Carolina have died since the war with Iraq began two years ago. Minnesota, Pennsylvania....and back home to a pile of work! 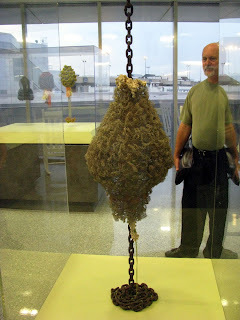 Unfortunately, traveling gets me far, far behind on my daily work and normal blogging. Posting a "recap" has often become necessary....and here's another such entry. Last week I was at the University of Minnesota's Split Rock Arts Program studying art quilts on a full scholarship. 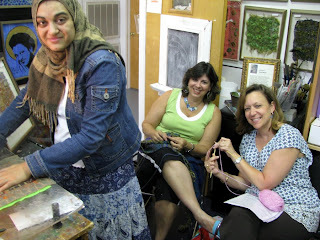 The class was filled with very accomplished artists and quilters. 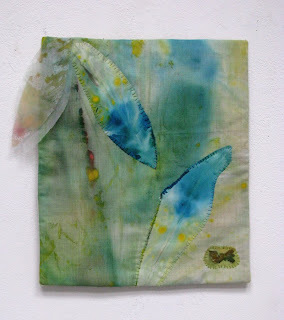 We painted fabric, mostly opaque and transparent silks, with watered down acrylic paint. The approach was unique. 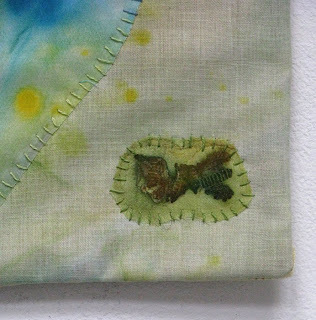 Fabric was layered, spritzed with water, and painted with loose, board strokes. 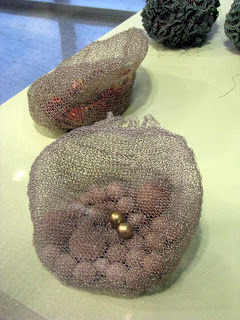 The "sandwich" of material often included objects like coins, strings, and buttons. Some layers were folded fabric. As the paint moved through the wet material, unique patterns were formed. We even applied pastels on the top. The results were unexpectedly wonderful. 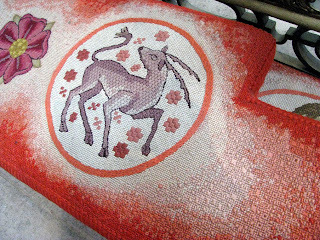 These painted fabrics became our non-objective pieces for quiltmaking. Cut shapes were applied to a base fabric. 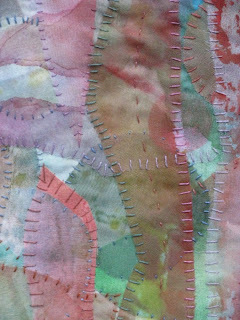 Transparent, but painted, sheers overlapped. The edges were hand stitched. The instructions included backing with a sheer material (revealing the back and its delicate hand stitches) and forming a binding and sleeve. 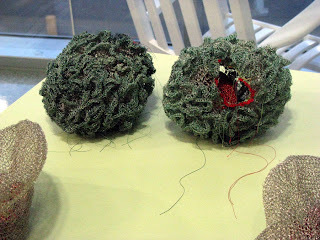 The best past of the week was undoubtedly meeting fellow fiber artists and sharing the experiences. Another great part of the week was the weather....it was great! Cool, clear skies were dotted with puffy white clouds. 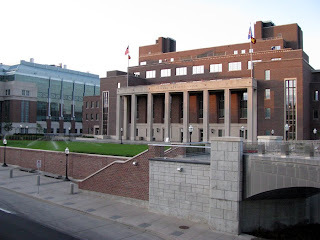 Being on a university campus brought back many memories. 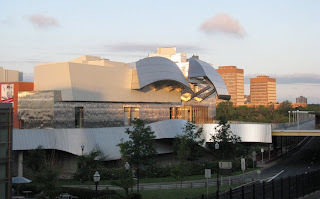 The Weisman Art Museum was free and included three great exhibits. 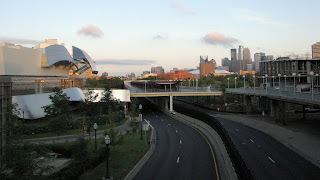 Mass transportation in the Twin Cities is phenomenal! Split Rock is clearly a quality program! So....What did I do? What did I learn? Above is my "class" piece. I'm calling it that. It's about 10" x 10". Below is a detail shot. Click on either to enlarge. I can safely say that I'll never be a non-objective artist. I really LIKE having a focal point and at least a suggestion of something recognizable. My work is meant to have more "content" than merely a title that reflects some thought process that privately belongs to the creator. Analyzing a composition by shapes and lines alone isn't my approach....and never will be. Of course, creating work in which a viewer's eyes travel pleasantly around the surface is a good idea....but it can't be my driving force. 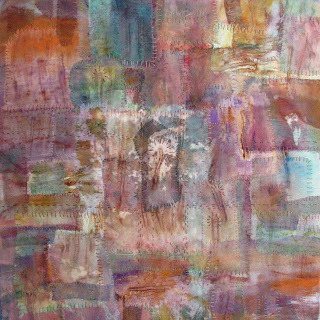 My work is a more direct expression of a concrete idea; it is meant to communicate; color and shape are not enough. The list of supplies for this course included "scraps" of material. I grabbed a piece of a vintage pillowcase with worn stitches and a handful of leftover silk and damask stained with rusted nails. I really liked the results. 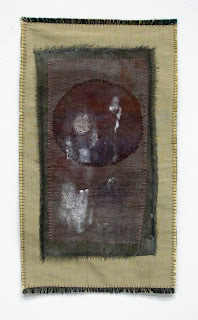 Fragment is approximately 14" x 8". I tucked it aside....refusing to cut a random shape in it. 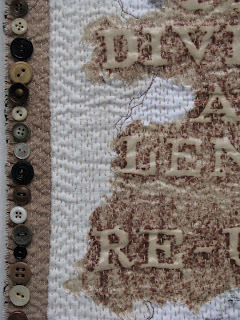 Once home, I backed it with an olive wool felt and buttonhole stitched the edges. As far as I'm concerned, it's done. 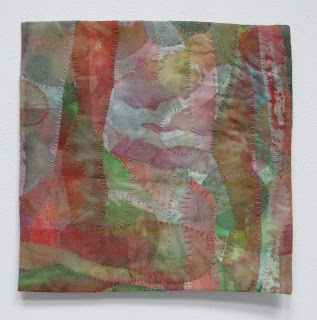 I'm toying with the idea of doing more painting like this....using fragments of clothing and other household linens....coloring something discarded for a new, life. There's a lingering memory in this piece. There's an appreciation of the past use, a suggestions of former value. This concept is important to me. I am acutely aware that pieces created in a classroom setting are not appropriately "original". Exhibiting this work is out of the question. Selling it outside a gallery situation is probably okay. Donating it to a charity auction is definitely fine...and probably the destination for these pieces. Yet, the one above isn't finished yet. I don't know if I want to work more on it or not. I could simple bind it off.....or I could do something radical and make it "mine". Any ideas? After flying away last Saturday, Steve and I headed north by car.... to Slippery Rock, Pennsylvania... to visit my parent (Dad's been in the hospital recently... but is much, much better)... and to visit my grandmother who turned ninety last December. It was a whirlwind, 24 hour visit that included a cookout with my younger sister Sonya and Vipin, collecting epitaphs in two graveyards, and going through a couple of boxes of vintage family photos. 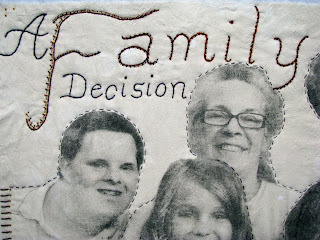 We drove back to South Carolina on Monday....ten hours of blessed stitching in the car on the next Grave Rubbing Quilt. It is almost done now....photos coming! 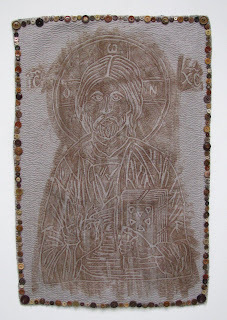 Oh...on the subject of grave rubbing quilts: 18th. Century Angel was just accepted into the Wichita National All Media Craft Exhibition, Sept. 4 - Oct. 18! At least I returned to this beautiful sight: Steve finished the framing on all six of the faux-stained glass pieces while I was in Minnesota....and lined them up for a great visual impression. 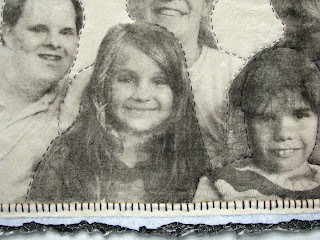 I'm almost caught up with the rest of the work that grew into an enormous pile in my absence! I made this grave rubbing in the Serbian Cemetery in Colma, California. 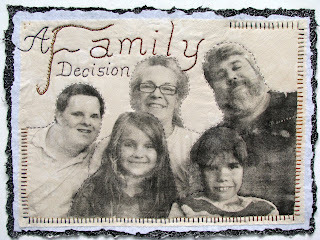 It is the largest single rubbing I've ever attempted and it turned out fabulously. Thus, it became a whole quilt. 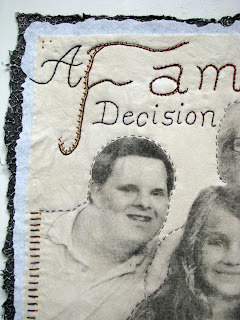 As I've recently learned, a whole quilt is created using a single piece of fabric for the top layer. It is generally white; has no patchwork or applique; and relies on the stitching for its ornamentation. Well, the fabric isn't exactly white and the stitching is simply the kantha running stitches and there is a design.....but, by and large, this is a whole quilt! I did the hand stitching during last week's trip to England. 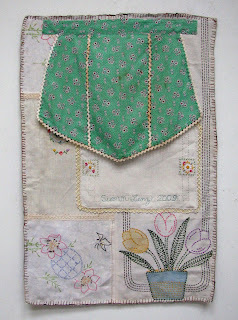 Once home, I finished it with vintage buttons, buttonhole stitches, and a unique reverse made of old household linens. The title is a rough translation of the letters found in the halo. The other letters, beside the halo spell "Jesus Christ". Although I still have hundreds of vintage buttons, I'm starting to run out of my favorite ones. This means that Steve and I will be attending a few more local auctions. Twenty years ago we used to go to an auction every week or so. We bought and sold all sorts of things, mostly antiquarian prints but also buttons, linens and lace. 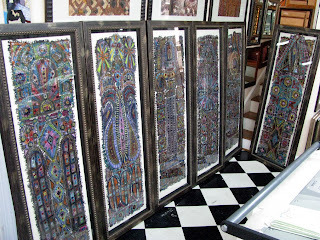 We sold them at Terrace Oaks Antique Mall in Charleston but then our framing business got enormous; we had no more time for auctions. Eight years ago I forcibly downsized Mouse House, our frame shop, in order to "become an artist". I've been using my leftover stash of notion and trim.....but I'm running out! Steve and I are looking forward to the "hunt".... which can easily become an addiction! 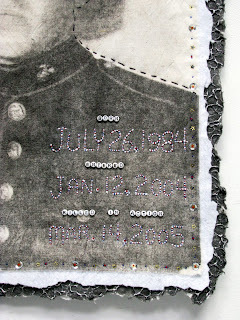 Oh...one more thing....THANK YOU, Ruth, for naming my last Grave Rubbing Series art quilt. The title Reverence is simply PERFECT! 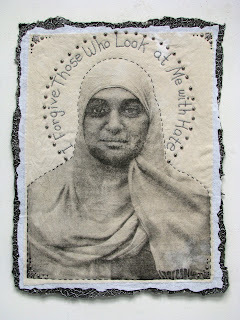 In fact, I entered it into a juried show with this title.....with luck, it might get in. Speaking of "getting in", Our Darling Sons was accepted by juror Pritika Chowdhry into Woman Made Gallery's upcoming exhibit "Cultural Memory: Transdiasporic Art Practices", September 4 - October 10, in Chicago, Illinois! England....a endless source for inspiration! Steve and I just returned from a wonderful week in Manchester, England. While there, we went to nearby Chester and Liverpool. I took hundreds of photographs. I scribbled down epitaphs for my hanging art installation. 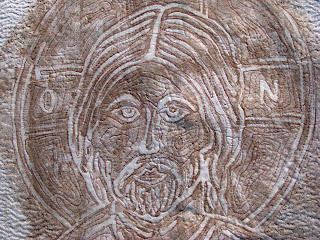 I got a few, utterly unique grave rubbings for potential art quilts. 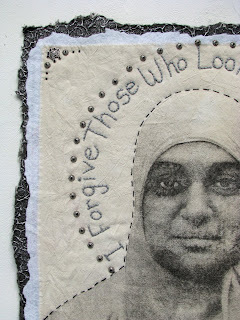 I stitched on the plane, on the trains, and during most evenings. 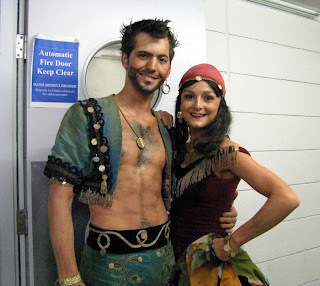 We watched two different performances by Birmingham Royal Ballet...twice each. Our elder son Mathias and his girlfriend Laura-Jane danced beautifully....and I wrote all about the trip on my "Family Blog". From the beginning, this blog was supposed to be my artistic journal...a way to write and share inspirations, new work, and creative impulses. It was never intended to document my life, day to day. Yet, there is no hard, fast line between my personal life and my artistic one....especially when traveling to England. Thus, my recap of our trip is now on "My Family Blog" and this post is just a way to share some of the energy, inspiration, and great work I saw during the past week. I knew it would be a "good trip"...right from the start. The fiber installation at the Philadelphia airport is always an excellent indication of the week. Leslie Pontz's work filled the Plexi-Glass boxes in the International terminal. I have no desire to knit or crochet scarves or sweaters or afghans.....but the desire to switch to un-eyed needles might take hold if I look at many more of these organic pieces. Each one was delicious, well crafted, and beautifully displayed. Public art is important. 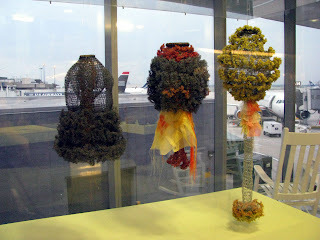 I look forward to walking through the Philadelphia International terminal....just to view the fiber art on display there. I really believe that our world would be a more beautiful place if there were more exhibitions of art......like I found in Salford, a suburb of Manchester....a few yards from the Manchester United Football (Soceer) Club's Old Trafford Stadium. 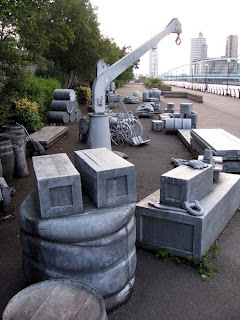 Along the quay in Salford was Silent Cargoes by Sites of NY. Quietly, these old artifacts bore witness to a profitable past while simultaneously decorating the modern canal side with significant art. In every town or city, I look for the church. It is generally among the oldest of buildings and filled with ornamentation, beautiful art, and a in England......needlepoint kneelers. This one was in the Manchester Cathedral. I loved the different stitches and it was exceedingly well crafted. Of course, I am currently writing down epitaphs for a hanging installation scheduled next February. 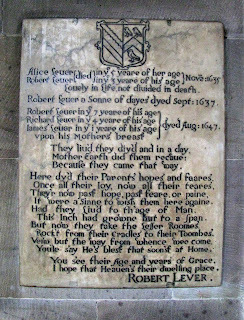 The Manchester Cathedral had this most touching one (above, click to enlarge.) I'm not sure exactly how I'm going to use this one....but it just must be worked into the project. 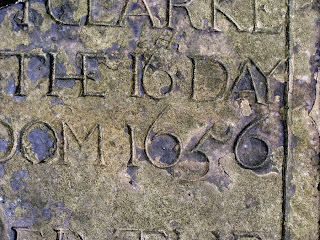 While in Eccles, a tiny old village on the outskirts of Manchester, I found five or six gravestones at the back of the sanctuary, including this one with a mid-17th c. date. 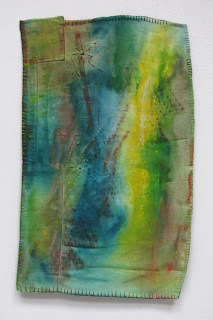 I was able to make several graverubbings....crayon on fabric. Yet, these stones were very textured, weathered, and not exactly ideal for a rubbing. I took loads of photographs and have an idea that will allow me to create a very unique art quilt. One of our "side trips" was to Liverpool. We visited the Tate Liverpool for a great experience with contemporary art. We spent most of our time around the Albert Docks and the Maritime Museum. I concentrated on architecture....especially the blend of old and new. 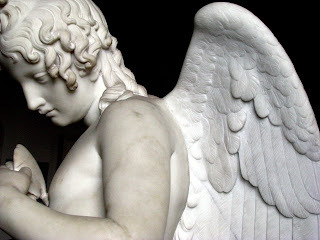 We saw the Cecil Beaton photography exhibition at the Walker Gallery and I took some great photos of winged sculpture in the marble gallery there too. Since returning home, I've been trying to catch up with the mountain of work that accumulated in our absense.....but at least this included mounting and framing my own six faux-stained glass pieces and finishing up another Grave Rubbing Quilt (photos coming soon! )....all before heading out again this Sunday. 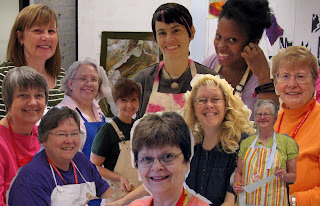 I was awarded a full scholarship to the Split Rock Programs in Minnesota to study art quilts with Emily Richardson. I'll look at the supply list and pack tomorrow! 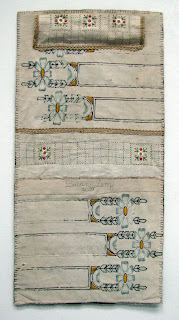 Back from England/Subversive Stitchers: Women Armed with Needles! The trip was wonderful. Mathias and his girlfriend Laura-Jane danced beautifully. I got to meet Laura-Jane's parents; they are fantastic. I took over three hundred photos. We spent a day in Liverpool and another day in Chester. We rode in a cute 1830s replica coal train but missed the last "ferry 'cross the Mersey". 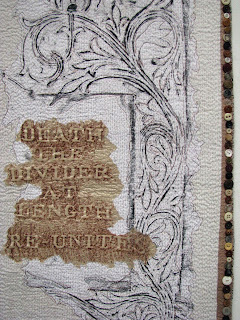 I stitched on two more grave rubbing quilts, collected several interesting epitaphs, and made a rubbing dated 1659! So...there will be blog posts coming soon. While away, the fantastic writer Dawn Goldsmith published my guest blog post on Subversive Stitchers: Women Armed with Needles! With a title like that, how could I possibly refuse to write! Anyway.....CLICK HERE to read the article. 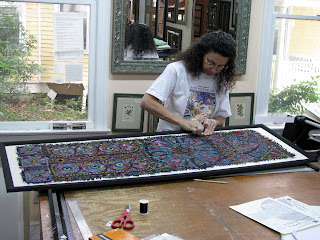 Now....back to work....including mounting and framing all six recently finished faux-stained glass pieces!